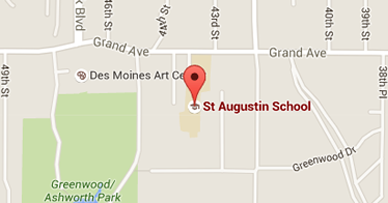 Welcome to the St. Augustin Catholic School Art news page. I am excited to meet my new students for the 2018-19 school year. Please check out the "About Mrs. Crawford" page to get to know me better. Check back to this website throughout the year for news and updates about what is happening in art at St. Augustin Catholic School. During the first two months of school, St. Augustin students worked on projects for the annual Home and School Fundraiser, Original Works. Kindergarten students focused on cutting and composition by creating a cut paper collage featuring ladybugs. They just finished learning about color and color mixing by making a Play Dough color wheel. They are putting their knowledge about primary colors to work through creating a composition based on the work of Piet Mondrian, an artist who used only primary colors, black and white. First Graders created a heart painting for Original Works. They were introduced to the work of Jim Dine, an artist known for using a heart as a subject. They learned about symmetry by folding and cutting their own heart, then painting it. Their next project was making a mosaic using beans. After the class finished, their tiles were arranged to make a larger design. They are now working on a painting based on Pop Artist Jasper John's painting, "0-9". Through this painting, First Graders are reviewing primary and secondary colors, and principles of design. The Second Grade learned about the symmetrical structure of a butterfly; they drew and colored their own for Original Works. Students were next introduced to the Hispanic celebration, Day of the Dead. They made Q-tip Day of the Dead skeletons, after learning about how the body is jointed and moves. Second Graders are now designing a print for a Christmas card. They are learning about using a printing plate and how printing creates a reversed image. Third Graders created mixed media snowmen for Original Works. Their next project focused on the Japanese art form, Notan. They used Halloween pumpkins as a subject for their Notan design. Currently, the class is doing a project based on the work of artist, Wayne Thiebaud. He is an American artist know for his paintings of desserts. Third graders are learning how to draw a three dimensional form and make it into a cake. The Fourth grade was introduced to the cut paper collage of Henri Matisse. They created a collage using their names as a subject for their Original Works project. Their next project was learning about making a monoprint. They used fall leaves and a wet-into-wet watercolor technique to make their monoprints. Currently, they are learning about the artist, Pablo Picasso, and will make a Cubist portrait. Fifth grade learned about creating movement and using repetition in design in a paper collage done for Original Works. They used their hand as a subject. They are now working on a self-portrait unit. They are learning about the structure of faces, proportion, measuring and drawing features. The Sixth Grade drew their house or a building that had significance to them for their Original Works project. They learned about selecting and transferring information from a photograph to a drawing. Using a baseline, finding proportion, using comparative measurement and determining angles were some of the skills they learned and practiced. They used colored pencil to finish their drawings. They are currently beginning a design project using leaves; they will complete it in oil pastel. Kindergarten students were introduced to the Lascaux Paleolithic cave painters in France. After making "cave paper", students drew symbols and figures in the manner of the cave painters, coloring them in the pigments available in that time period. Next, they made a petroglyph from clay. The used a stick to draw an figure in the clay then glazed it. Their next project was based on the African American artist, Beverly Buchanan, whose work centers around making small "shacks" which celebrate the ingenuity and resourcefulness of those who built the rural architecture she grew up around in North Carolina. They are currently making a building from popsicle sticks then coloring them in the bright colors and patterns used by the artist. The First grade finished their paintings titled, "1-9", based on the Jasper Johns painting titled, "0-9". Hung together, their artwork shows the serial image characteristic of the Pop Art period. Their next project was constructing a "Paper Playground". They used paper folding techniques to learn how to make a 3-D structure from 2-D materials -as well as a wealth of imagination inventing what their playground would do. They are currently working on a torn paper collage using a zebra as their subject. They have been proud of their success in drawing a zebra and learning how to control paper when they tear it. The Second Grade were introduced to the Japanese art of origami. They made an origami house and individualized their structures by the architectural elements chosen. Together, their houses made a village. Second Graders learned about texture through making a sandpaper mono-print in their next project. They were introduced to a technique called encaustic -melted wax painting- used by the ancient Egyptians in their fayum portraits. Students watched their colored images on sandpaper transform when heated with an iron. The Third Grade learned about Swedish artist, Claes Oldenburg, whose sculptures -the "Crusoe Umbrella" and "Plantoir"- are icons in Des Moines. They made a papier mache donut in the manner of the Pop Artists who made their objects look real but from a different material. Some of their donuts look so real, you will be tempted to take a bite! Fourth Graders have been learning about color terminology and mixing values of color. After learning about the Dutch landscape artist, Ton Schulten, they drew a cityscape on gridded paper, using size and overlapping to show distance. They used and mixed different values of colors to paint their cityscape. They learned how to use their brush to control the paint as they worked on the many different sized shapes in the painting. Fifth Graders completed and displayed their pastel self-portraits with a written paragraph about what they like about attending Catholic Schools. Their next project involves building a radial design in relief using origami. Students show their inventiveness in using the different folds and colors to build their designs. The Sixth Grade focused on the Elements of Art and Principles of Design in making a composition using leaves as their subject. They used oil pastel to complete their work. They are currently working on a metal relief project. Sixth Graders made a design using their initial as a subject then used the techniques, repousee and chasing, to form it in relief. After mounting the metal on board, students are creating an extended design to frame their metal. St. Augustin held an Open House during Catholic Schools Week which featured a piece of artwork created by each student. Parents and families were able to see their children's abilities and creations. The Seventh and Eighth Grade had their work from the Art Center on display in the library and upstairs, in the Middle School.